Serbs write their language in Cyrillic or Latin letters in seemingly random distribution. Hindi-Urdu is written in Nagari by Hindus and in the Arabic script by Muslims. In medieval Scandinavia the Latin alphabet, ink and parchment were used for texts 'for eternity', whereas ephemeral messages were carved into wood in runes. The Occitan language has two competing orthographies. German texts were set either in blackletter or in roman type between 1749 and 1941. In Ancient Egypt the distribution of hieroglyphs, hieratic and demotic was much more complex than commonly assumed. Chinese is written with traditional and simplified characters in different countries. 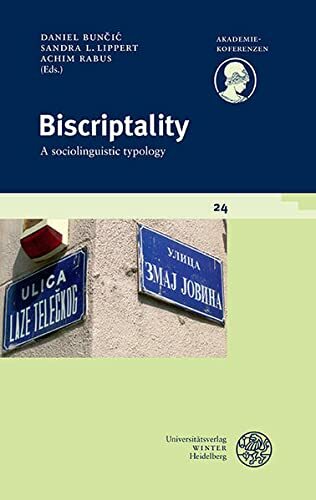 This collective monograph, which includes contributions from eleven specialists in different philological areas, for the first time develops a coherent typological model on the basis of sociolinguistic and graphematic criteria to describe and classify these and many other linguistic situations in which two or more writing systems are used simultaneously for one and the same language. Jurgen Spitzmuller is a research assistant in German Linguistics at the Department of German Studies of the University of Zurich. His research interests are discourse theory, language attitudes, language ideological debates, and social semiotics of written language.